Rarely do I have trouble sleeping, but if I have a cold or cough I usually have to take some kind of cold medicine to knock me out. 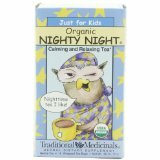 Not now that I found this Nighty Night tea (nighty night tea at amazon.com. 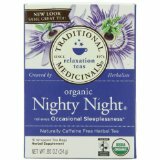 The natural herbs in it definitely make you drowsy, like NyQuil without all the alcohol (I love NyQuil too but you can only take it 3 days). And they have a kid version too. My son loves to drink it when he has trouble falling asleep sometimes after late sports practice. Just wanted to pass this along to all of you. You can get it at most super markets and Target also carries it.